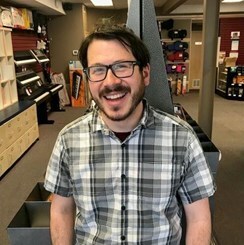 My name is James and I teach trombone here at the Burien Music & Arts! Every student has different interests, strengths, challenges, learning styles, and backgrounds which should come into consideration, so I come into a first lesson with a bunch of questions. Students should have opportunities to perform and to experience music as part of community gatherings whether they be recitals, concerts, festivals, or jam sessions, and I encourage students to attend such events. The more technical side of my teaching philosophy is to show students how to practice effectively and attentively until they can do it themselves. This starts with playing simple warm-ups and paying attention to breathing, posture, and other elements of proper technique, while identifying and eliminating tension. Then I teach students to break down their music into small chunks they can practice slowly and carefully. Then we put the music back together. I like to play duets with students so I can model for them and they can experience playing with others in a setting other than a large school or community band. When teaching jazz improvisation, I prefer to start with a linguistic approach and add the theory in gradually. Improvisation is often scary for students, so I try to hard to make it fun and playful. While teaching any kind of music, I like to make sure students know where that music came from and what its history is. I have been teaching for approximately five years. My first teaching experience was through service learning programs at Western Washington University. While in school, I also designed an taught a jazz improvisation class for middle schoolers and directed one of WWU's jazz combos during my final year. Later, I began to volunteer independently with music programs including the Bellingham Youth Jazz Band, Bellingham Girls Rock Camp, and the Vancouver Symphony Orchestra School of Music's jazz summer program as well as public school band programs in Whatcom and Skagit counties. I started teaching private lessons (on more than just an occasional basis) in 2015. Since moving to Seattle in late summer of 2017, I have been the trombone coach at Washington Middle School and have been looking for other ways to become involved in education. During the day, I sub as a para-educator in the Seattle Public School District. As a kid, I studied trombone, piano, and cello while also playing tuba in the high school band. I went to college at Western Washington University's Fairhaven College of Interdisciplinary Studies and designed a concentration called "Teaching Jazz for Social Justice," graduating with a BA in the Spring of 2014. I have been performing (not counting school groups) since 2010 (about 8 years). I am a member of Hot Damn Scandal, a Bellingham-based Americana band which has performed at festivals such as Northwest Folklife, The Oregon Country Fair, Ollala Americana Festival, and the Subdued Stringband Jamboree. I perform in a trio with the musical, Dragon Lady, which has been at The Jones Playhouse (Intiman Theater) in Seattle and at Oberon Theater (American Repertory Theater) in Cambridge, MA, as well as other venues. Having recently moved to Seattle at the end of the summer of 2017, I am just beginning to get involved with new projects in town. These include a Traditional Jazz group (yet to be named) and a Klezmer brass band called Shpilkis. I perform off and on with other groups, including the Bellingham based bands Yogoman and Babycakes. I perform mainly on the trombone, but occasionally also on tuba, piano, or harmonica. Request Lessons with Jimmy today!